Selkirk Fairtrade | Selkirk – a Fairtrade Town! 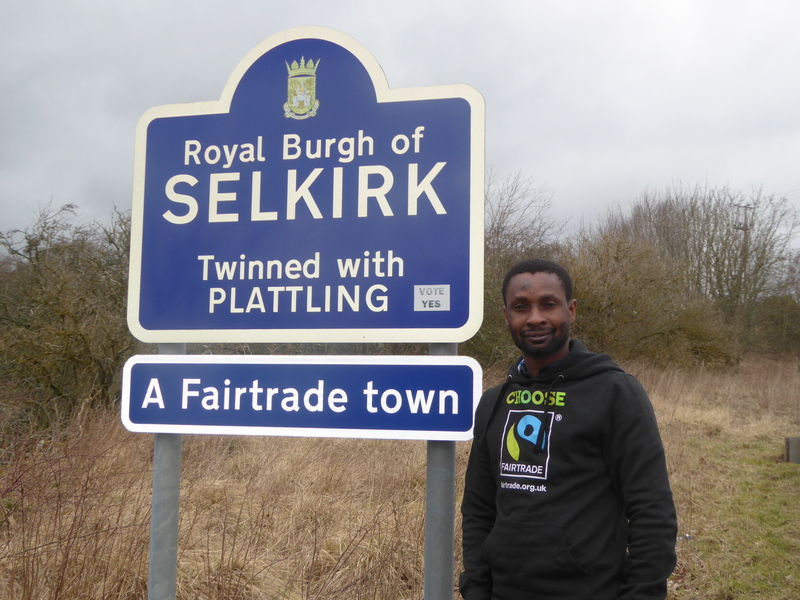 Selkirk – a Fairtrade Town! Fairtrade sales soar in Selkirk. A big thank you to everyone in Selkirk who supported the Fairtrade Big Brew and our Fairtrade Pop-up Shop last week. You bought an amazing £859.49 worth of Fairtrade goods from a wide range of countries. Money earned by farmers and craftspeople through the Fairtrade Co-operatives gives them a fair price on the world market, enabling them to feed their families and send their children to school. As well as this we have been able to send £520 to Traidcraft to support their FIVE project: Flourishing in Vulnerable Environments. This project trains Kenyan small holder farmers on techniques to improve their soil, understand climate change and increase their yields. So far 6,000 farmers have been helped and 30,000 people will benefit. Helping the farmers in this way lessens their chance of failure which would lead to starvation! Once again, thank you for all your generous support. Open Door plays its part in Fairtrade Fortnight. Lunch on 13 March saw fairtrade pasta on the menu, Fairtrade placemats along with a world map showing where Fairtrade products come from. There was a Fairtrade stall where folk could purchase Fairtrade goods and each person was given a small jar of Fairtrade marmalade. Selkirk’s Big Brew for Fairtrade Fortnight, held last Saturday morning in the Parish Church Hall, was a roaring success. 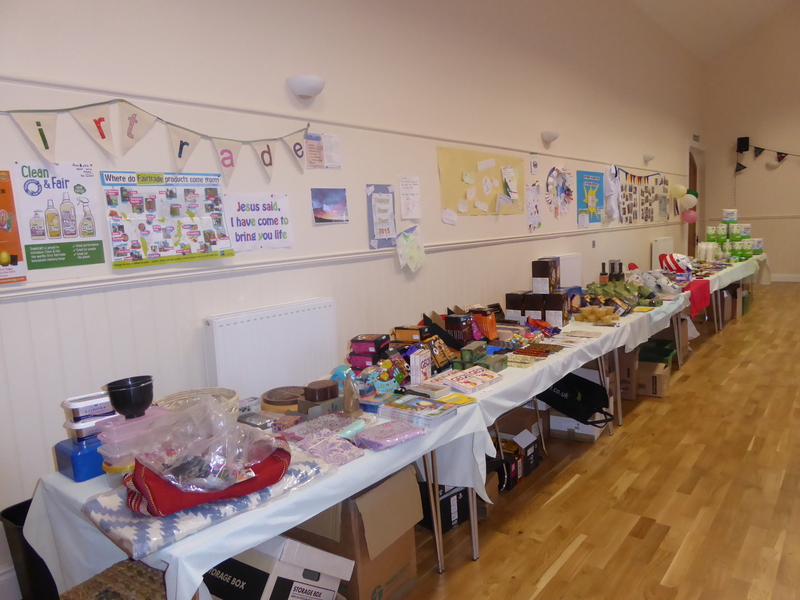 Over £260 of Fairtrade goods were sold which will benefit Fairtrade producers, and a further £500 was raised from the Fairtrade baking stall, the chocolate fountain and door receipts for Traidcraft’s FIVE project which helps farmers in Kenya to make the most productive use of their land. Our MP Calum Kerr accepted our invitation to come and was presented with a Fairtrade goody bag and postcard petitions encouraging him as an MP to consider the opportunities and obstacles facing Fairtrade producers as post-Brexit trading deals are negotiated. Thanks to everyone who came and made Fairtrade purchases, to folk who ran the stalls and the children’s activities, and all those who helped with serving and in the kitchen, not to mention setting up and clearing away. Don’t feed exploitation, choose Fairtrade. Fairtrade Fortnight back in Selkirk. Dressing up as a banana may be a step too far for some, but it certainly attracted customers to the Fairtrade Pop-up Shop. Over £400 of Fairtrade products were sold in two days. Thanks to all who purchased them! It’s a scandal that the people who grow the food we take for granted can’t always feed their own families. We can support farmers and workers to put food on the table for their families by harnessing the power of a Fairtrade breakfast. Will you help us get as many people as possible to eat a Fairtrade breakfast in Selkirk during Fairtrade Fortnight? Please sign up in church, in Selkirk library, Sainsburys, The Co-op or Down to Earth to register your support! What counts as breakfast? A fairtrade drink ( tea/coffee/juice) and one item of fairtrade food. Some suggestions – a banana; a geobar or muesli; prunes,grapefruit or pineapple pots ; marmalade, honey, or chocolate spread. All these items will be available to buy in the parish church, and St John’s during Fairtrade Fortnight. Or buy a FT bar from Down to Earth and your FT drinks from the local stores. Local artists WASPS lent their support to Fairtrade at their open weekend. Fairtrade pasta played a leading role in their creations. Who knew pasta could take so many different shapes and colours! Selkirk successfully renews Fair Town status! The Selkirk Fairtrade Group was delighted to hear last week that their application to renew the town’s Fairtrade Town status for a further two years has been accepted by the Fairtrade Foundation. In her letter of acceptance, Rachael Sweet, the Fairtrade Foundation’s Communities Campaign Officer, said ‘Congratulations to you and your group for successfully renewing Fairtrade Town status for Selkirk. It is clear that a lot of time and energy has been put in to make Fairtrade a part of the community so we would like to pass on our congratulations and say thank you to everyone who has been involved. We hope you will all continue to support Fairtrade in Selkirk starting at Scott’s Selkirk on Saturday 3 October. There will be a Fairtrade stall in the Parish Church coffee shop, and Fairtrade activities and refreshments at Wasps Artists Studios. 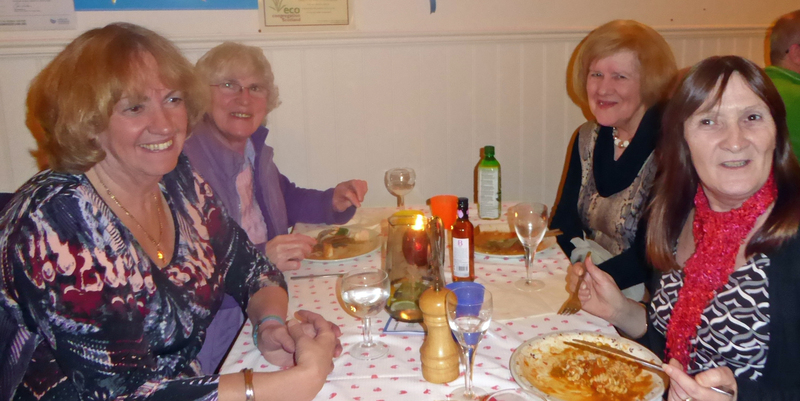 Fairtrade Fortnight in Selkirk was a resounding success! The two pop-up shops, a pasta party and coffee morning resulted in the sale of over £850 of Fairtrade goods. In addition to this £317.52 was raised for the Traidcraft Fair Essentials campaign. This sum will be doubled by the government, meaning over £6oo will go to benefit impoverished food producers. Thank you to all our generous supporters. Selkrik Fairtrade group also ran a FT Facts Quiz which challenged people’s knowledge. See how you do with the questions below. a) How many Fairtrade products are available in the UK? b) How many Fairtrade towns are there in the UK? c) Smallholder farmers produce 50% of the world’s food, but what percentage of the world’s poor do they make up?